Can learn many different IR remote control protocols. Not limited to a few specific ones. In keypad mode, most remote control commands are repeated if key is held down. Add IR remote control of other equipment to your next project. With IRMimic, just apply power, train the chip with the IR remote control commands you want to generate, and you're ready to go. Command patterns are safely stored in internal non-volatile memory. IRMimic can be re-trained many times if needed. IRMimic can learn up to sixteen different remote control commands, each in a different format, if needed. In keypad mode, up to 16 pushbutton switches, plus the "Learn" switch, can be connected. Each key controls a different command. You can also control IRMimic with your favorite microcontroller, using MCU mode. Just provide 4 code select inputs, a learn input, and a send input. Based on an 18-pin Microchip® PIC 16LF87 CMOS microcontroller with EEPROM, IRMimic has been developed to work with most modern IR remote controls and accompanying equipment. It supports bi-phase, pulse width, and pulse position encoding techniques, as well as others. Please download IRMimic chip data sheet. Also, please take a look at the schematic for the IRMimic pc board and the sample application schematics. Kit includes IRMimic chip, on-board voltage regulator, 38 KHz IR sensor (works with most remotes, although several modulating frequencies are used), indicator LED, IR LED, 12" ribbon cable, 14-pin dual row header accepts female ribbon cable connector (included) for power, control signals. 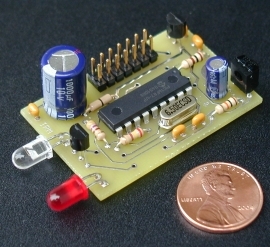 Regulator not required if 5V DC is available. Board dimensions: 1.25" x 1.9". Please download IRMimic chip data sheet, IRMimic assembly instructions, IRMimic schematic diagram, parts list, and IRMimic parts placement guide. Note: You will need to connect this kit to either some switches, or to a microcontroller to complete your design. Please see sample application schematics. Note: All parts needed to populate pc board, except the IRMimic chip, can be purchased at www.Digi-Key.com. The Vishay IR receivers and many of the other parts can also be purchased at www.Mouser.com. Of course, the easiest way to get going is to purchase one of our complete kits. This schematic shows how a keypad would be connected to the board. This schematic shows an MCU being used for control. This schematic shows how the board can be controlled in MCU mode with switches. Here is some information related to powering IRMimic from batteries. Here are several circuits (and a rather thorough analysis of them) for driving the IR LED with a constant current instead of a simple resistor, so that emitted IR intensity is relatively independent of battery discharge state. This material was sent to me by an IRMimic user. IRMimic was designed to support as many different IR remote control command formats as possible. Some manufacturers use unusual operating frequencies, or formats that are simply not supported. IRMimic is not guaranteed to work with all remotes or equipment, but it should work with most of them. Here is some information on equipment that has been tested so far. Also, different remotes use different "modulation" frequencies. The above kit includes an IR receiver that is most sensitive to a modulation frequency of 38 KHz. All learned commands are transmitted using a modulation frequency of 37.8 KHz. This value was chosen to work with the widest range of equipment. If the original remote is operating at a different frequency, you will get reduced range/sensitivity.